The HSL (hue, saturation, lightness) tool in Photoshop is pretty seductive. Pick a target color and then you can make boost the saturation or tweak the color a bit. It’s easy to understand and often does a great job. But it has some important limitations. The most important is that there’s natural adjustment of tone along with the color. The lightness slider is just about useless. Push it left and you get dark and drab, push it right and you get dull desaturation. If you try to increase saturation with lightness, the result often includes odd color artifacts. What does that mean? Well, let’s say you want to make some green trees look more like an autumn yellow. With HSL, you can set the yellow hue to -20 (since trees that look green are typically selected with yellows). That will make the trees look more yellow, but they will look dull. The leaves will be too dark and not saturated enough. You can then boost lightness and saturation to make them look better. But they interact with each other strongly, and it’s unclear which to move first or how much to find that magic balance of S and L. And once you do, you’re still going to have a result that probably won’t look as good as what you could get with Selective Color. If I haven’t convinced you yet that it might be a better tool, I hope I’ve at least piqued your interest in trying it out. What’s the downside? It’s more complicated to understand, especially if you don’t have a solid understanding of color theory or experience printing in CMYK. But don’t let that intimidate you. The tutorial below will show you some basics on the theory in the tutorial below to get you started. And more importantly, this is a tool where you can play even if you don’t understand the theory. It might take you a little longer, but you’ll be able to get some great results with a very simple workflow. Process your RAW for color. If there is too little saturation for a color, it won’t be properly targeted. And if your white balance is incorrect or there is a strong cast across multiple colors, you may have trouble selecting the right areas. So make sure you use proper white balance, consider pushing the color during RAW conversion, and save any color grading (adding deliberate color casts such as a cool moody blue) until after using Selective Color. 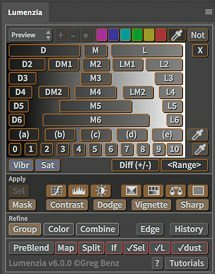 Create a new Selective Color adjustment layer (Layer / New Adjustment Layer / Selective Color, or just click the new adjustment layer icon at the bottom of the layers pallet). This will let you work non-destructively, which I generally recommend with this tool. Start out in the “relative” mode. This produces the most natural results. Use the color dropdown to select your target color (red, green, etc) or tonal range (whites, neutrals, blacks – note that these select by luminosity, and are not just targeting desaturated values). Note that Photoshop’s definition of a particular color may not agree with your definition, so try the neighboring colors. A common example of this is the need to use yellows to adjust green trees (and sometimes even cyan). Move the CMYK sliders back and forth. If you understand color theory, that will be very helpful in this step. But there’s nothing wrong with just playing around and seeing what looks best. Select and adjust other target colors as needed. I find it often helps to adjust the neighboring colors. If you still need more color, try switching to “absolute” mode or duplicate the Selective Color layer. Relative mode will let you make more extreme adjustments, but may cause loss of color detail. And keep in mind that a duplicate layer is going to work on the output of the first layer, so the targeting may shift a bit. Try both to see which looks better, and then tweak the better result as needed to finish. In relative mode, you are very limited in your ability to increase CMYK if the existing color doesn’t have much of a given component. This is most likely when you might need to think about relative mode (particularly for pure cyan, magenta, and yellow – since they are dominated by a single CMY component). Sliding to the right shifts toward Cyan, Magenta, Yellow. Sliding to the left shifts toward Red, Green, Blue. Moving any slider right tends to make the color perceptually darker, while sliding left makes it perceptually lighter. Think of CMY as a group relative to each other. Setting Y to +60 or C and M both to -60 will both increase yellow saturation. However, moving Y to the right will darken while increasing yellow saturation, while moving C and M left will lighten while increasing saturation. The math of all of this is very hard to predict (particularly in absolute mode), so expect unexpected results and play around.